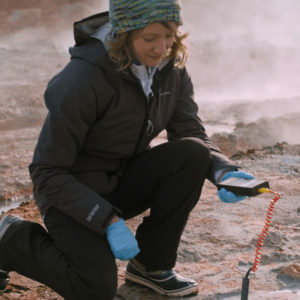 Intrigued by life on other planets, Dr Louisa Preston studies microbes in Earth’s most extreme conditions, in the hope of finding life elsewhere. Louisa braves ice rain, acidic steam and frozen fog in pursuit of new knowledge, pushing the boundaries of exploration to the limit. If life can survive in such conditions on our planet, surely it must be able to on others too? Amazing environmental features are constantly being discovered on the Red Planet such as volcanoes, ancient hot springs and impact craters. These features, also prominent on Earth, link our world to Mars – planet Earth can be used as a “natural laboratory”, using extreme conditions to discover microbes which could exist on other planets. Recently, Louisa explored the extreme terrain of Iceland, fully equipped with her weather-proof Craghoppers kit keeping her protected from the elements.